At Kate Maller Jewelry we believe in protecting people and the planet. We also believe in good design. That's why we do things a little differently. A longstanding passion for environmental and social justice has shaped our commitment to sustainability. Kate's architectural background has honed her eye for detail, her affinity for experimentation, and a sensibility for craftsmanship. Each and every piece is handcrafted in Kate's studio in sunny Denver, CO. Kate's love for the environment extends into her design practice. Her work is organic in its process and aesthetic, as she is continuously inspired by the world around her. Reflecting and taking cues from the imperfections found in nature, Kate’s work aims to reveal the allure of organic forms and textures. The curious formations she creates are a translation and celebration of the raw beauty she sees and admires in the landscape. EC Design jewelry is hand-forged and fabricated by Artist Emily C. Johnson. Often described as subtle but edgy, EC Design jewelry is a playful mix of raw hammered metal work, simple geometric shapes, and unexpected details. Fundamentally, philanthropy is the core and guiding principle of Thesis Gems and Jewelry. We are proud to be able to not only give back to our local US environmental efforts through 1% For The Planet, but also work towards giving back to the local mining communities where our gems originate. Blair Lauren Brown incorporates mother nature in her most beautiful form, marrying concepts from rugged Alaska, the enchanting islands of Hawaii and the colorful seasons of Idaho and Colorado. Patricia Lauritzen - When I was a little girl, I would sit in church holding my mother’s hand and admire her diamond engagement ring. I loved how her diamond dispersed the soft light into winking colors as I listened to readings and songs about the value of being humble, kind, and giving. It is heartening to see the world of human rights and the jewelry supply chain coming together. Christina is a former human rights attorney, now working as a goldsmith and jeweler. Born into a passionate, entrepreneurial family, Myriam Elie founded MYEL with the wish to create a tailor-made career for herself. Born in Alaska and raised in Maine, my creative sensibility is steeped in saltwater and mountains. When I was too little to walk I was pulled around on a sled by a GermanShepherd called Rusty. I love making things with my hands and have been creating jewelry and art for as long as I can remember. I live with my wife in Santa Fe, New Mexico, and travel to see the ocean as much as possible. I launched my namesake jewelry line in 2013 so that I could make beautiful wedding rings out of recycled gold for my friends. Since then the collection has expanded and evolved. My jewelry is inspired by and made for all of life’s adventures. These pieces are designed to be modern heirlooms for men and women. I am committed environmentally sustainable practices and I make all of my jewelry by hand from reclaimed solid sterling silver and 14k gold with ethically-sourced stones and conflict-free diamonds. Miw, short for Maria Irene Weinz, was born in Bogota, Colombia. She has lived in the Caribbean, the Middle East, Africa, and Papua New Guinea. Miw has spent most of her life along coastal areas where she even taught scuba diving. I have an MFA in Painting and have worked in ceramics, mainly with porcelain. Both these disciplines have brought me to where I am in my jewelry making. I have been working in jewelry design and fabrication since 2009. It is a passion for me. It helps me communicate ideas both in the making of the pieces and in the final product. Jewelry designer Saskia Shutt set up her jewelry business in the UK in 1999. In 2009, she relocated to her home town of Brussels. Her jewelry workshop is situated in the design and fashion district in the heart of the city. Christy Natsumi is an independent fine jewelry designer in San Francisco, CA. We specialize in wedding rings, engagement rings, and modern jewelry essentials so you can wear meaningful reminders of all of your special celebrations. We love a clean, minimal look accentuated with a twist to make sure you are getting something that is unique but will also stand the test of time. Christy Natsumi is proud to be a certified San Francisco Green Business and has been featured in The Knot, Design Sponge, Brides, and San Francisco Magazine. 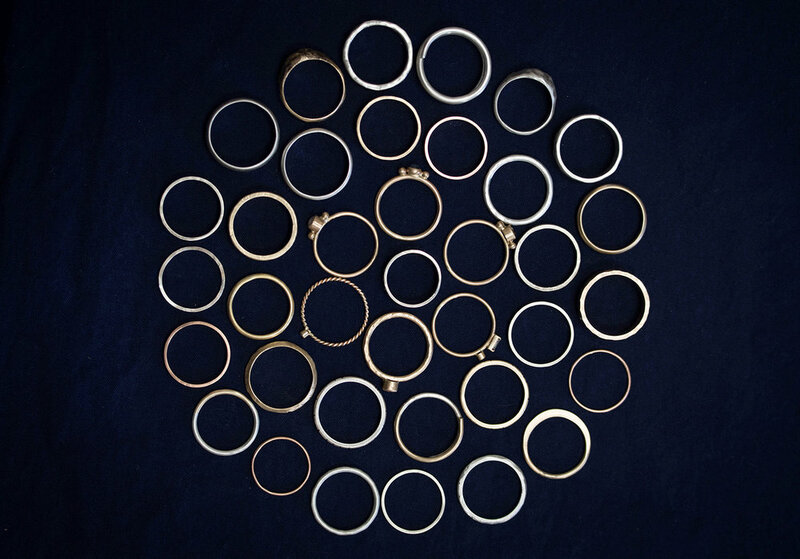 Handmade bespoke eco-friendly & conflict-free fine jewelry, wedding bands and engagement rings, designed by Aran Galligan in Seattle, Washington. Our mission is to create future heirlooms in a socially and environmentally responsible way. Jennifer Dawes Design, established in 2000, is a visionary jewelry brand dedicated to complete transparency, sustainability and artisanal eloquence. We are committed to producing jewelry that is a direct extension of our foremost values. The company is built upon the importance of doing what we love and recognizing the value of the human spirit throughout the entire jewelry making process-from honoring the land and the cultures impacted by the mining of metal and stones, to the personal experience of the client choosing a piece of art to celebrate a significant moment in their life, to the importance of the artist creating a beautiful, finished piece of jewelry. Luana Coonen is known for her mystical nature-inspired jewelry, created with traditional goldsmithing techniques blended with a modern and feminine design aesthetic. Born and raised in the tropics of Hawaii, she has an undeniable connection with nature, it's in her blood. Raised by a farmer father and artist mother, she learned to appreciate every unique aspect of nature and how to bring those lessons into an art practice. Her jewelry is focused on the delicate balance between the organic and the manmade. My most accessible body of work, TS Classics, is the evolution of a 45 year old family jewelry business founded by my father in 1972. Hand-forged and sculpted in sterling silver & 14k gold & 14k gold-filled wire, this line is inspired by various periods of art & architecture. East Fourth Street Jewelry creates sustainable jewelry for the discerning, conscientious person who understands and loves good design. They are dedicated to responsible supply chains that speak of their ethics of transparency in environmental and ethical mining of their metals, diamonds and gemstones. 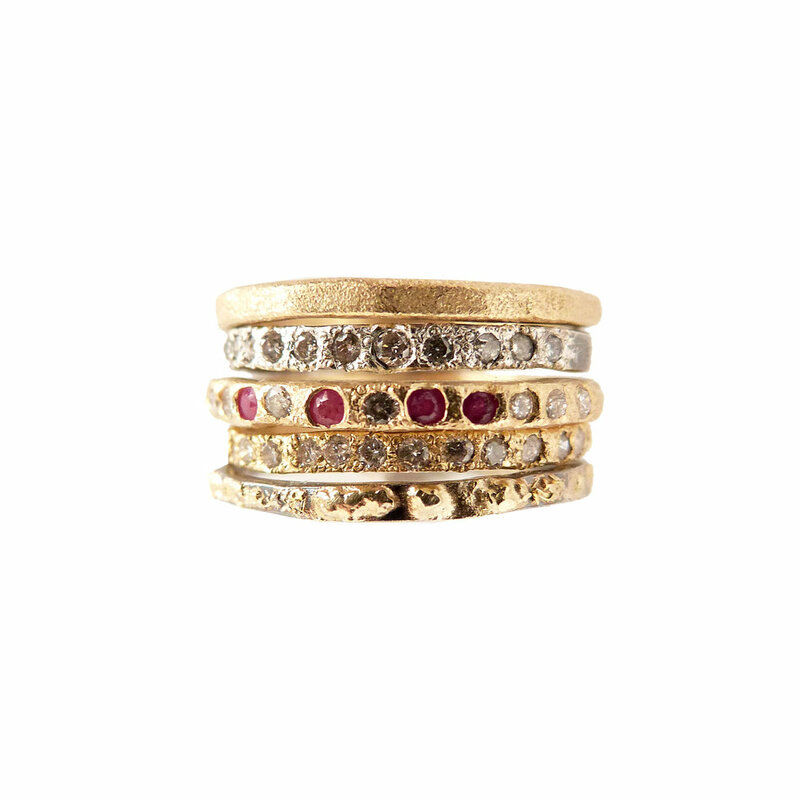 The rings in Wendy Woldenberg’s collections are designed and created entirely by hand. Embracing traditional goldsmithing techniques, Wendy steers clear of computer tools like CAD in favor of the human hand. The resulting collections have the beauty of subtle differences and unique features. Kathleen Lynagh House creates jewelry that embodies her love of design, creativity and fine craftsmanship. A native of Philadelphia, she received her Bachelor of Fine Arts in graphic design from Arcadia University. For several years she worked for the Hillier Group, a highly respected architectural firm, as Senior Graphic Designer and Associate. While working for the Hillier Group, she was selected to attend a unique program offered by the Yale School of Design, in Brissago, Switzerland, where she studied sculpture, graphic design, and photography. What better way to communicate meaningful, lasting beauty than to design natural evolution-inspired jewelry made from socially and environmentally responsible materials? My work is about beauty found in natural forms: made of natural materials, championing nature. Susan has a formal background in art and poetry but came to jewelry through the craft school and Park District studio in Chicago. She is passionate about responsible sourcing and works to further the cause of responsible jewelry practices throughout the jewelry industry.